← How Many WorkFlowy Bullets Do I Have? Excellent and nice enhancement, since we last spoke. Well done! Orphan hunting was the primary reason I made this. Love the continued extensions/bookmarklet’s for WorkFlowy! There is one feature I keep hoping for – wondering if it’s even possible to create. From what I’ve seen here so far – if it’s possible, you may be the one to ask about it! I would like to create tags with numbers (ie: #30 or #90) that would represent the estimated minutes a task would take. Then, if I could use FlatFlowy to limit the list, and then another bookmarklet to show me the TOTAL represented by these number tags that would be very awesome. It would help me estimate my time better and help me to not get so overly optimistic about what I can accomplish in a day. Any chance of creating something like this? Is it even possible? I am not familiar enough with programing to know: could something similar work in Workflowy? FlatFlowy won’t be part of the solution. It works on different code, hiding things from you, but not WFcount. I need to understand your outline structure & use cases before I can say anything definitive. Contact me at rawbytz at gee male; I think we can get things figured out in a few questions. Cheers! Don’t forget to let @Laura H know you did this…. Ha! Sophie your comment made me smile. Be careful! Using this bookmarklet may raise your geekiness factor to dangerously high levels… Rather than typing slow, I may just type long… apologies in advance. If you want to count all tags you have two options. In both cases, you need to decide if you want to include completed items. Click on Completed: in the toolbar to toggle it between Hidden and Visible. Method 1: From your home page, search for “# OR @” (don’t include the quotes). This will show all your tags, since WorkFlowy tags only start with those characters. Then click on WFcount. btw: OR is a special search operator. It must be ALLCAPS with spaces on either side. When not used, WorkFlowy treats spaces between search terms as AND. 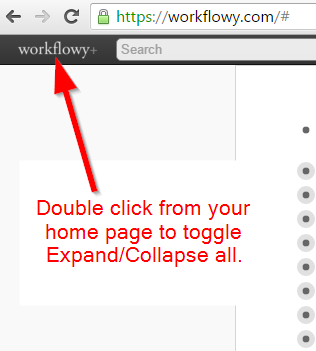 Method 2: From your home page, double click the WorkFlowy logo to the left of the searchbox. This will Expand All bullets (clicking again will collapse them) The advantage of this method is it will also give you an accurate count of all your bullets. Method 1 will not. The big disadvantage of this method, is that WorkFlowy remembers the expand/collapse state of all bullets. Some people are picky about that, and this method messes with their setup. I have 200 parent bullets that I go through manually and count every month. Is there anyway to make a bookmarklet for WFCount to target specific urls (or specific bullets)? It would be awesome to be able to count all 200 parent bullets and know how many children they all have in a single click. Also, I use your Clip-to-Workflowy app and your offline Workflowy app everyday. They are so useful to me – keep up the good work! 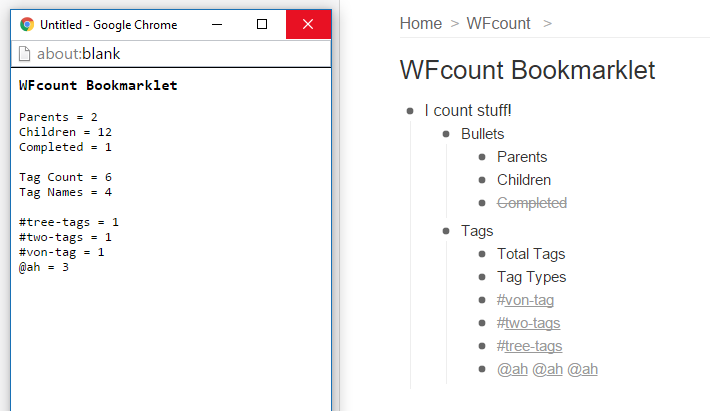 Good: I made a bookmarklet (called nodeCount) that returns the bullet count for the first 3 levels: home, children & grandchildren. btw, it counts all bullets including completed, and does not distinguish between the two. Bad: WorkFlowy has been implementing changes that have broken a good number of my bookmarklets inlcuding nodeCount. I am communicating with WorkFlowy and hope to have things working again soon. Hello. We LOVE your coding. You’re our hero at our nonprofit. 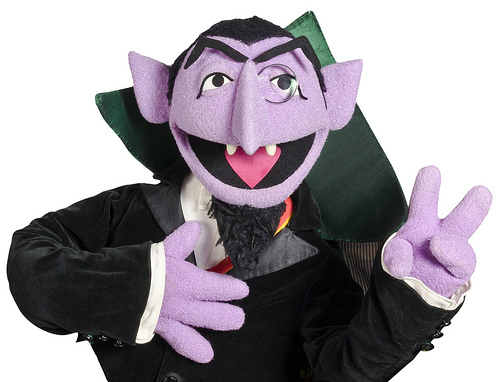 But — could it be that WFCount has stopped working correctly? We no longer can get accurate counts — and it’s just happened in the last two weeks sometime. We checked it on multiple computers. Any possible thoughts for us? It broke Wednesday with the latest WorkFlowy release… which now loads the html sequentially as you scroll. This makes WF much snappier rendering that first page of bullets, but it wreaks havoc with some bookmarklets (like WFcount). The short term workaround is to manually scroll to the bottom of the page, then activate the bookmarklet.